He used to be a brave, spunky, and adventurous little bunny. But the new "host" of that body is currently confused and trying to put pieces of itself back together. He was an orphan with no existence of his past family life, until he met a ferret named Joshua and became good friends. After a while, Joshua's family adopted him and he became part of the Robinson family. But a few days later, he developed a liking in Josh and loved him more than just friends/brothers, but the two kept their relationship secret from everyone, even their parents. Three months later, their family tree had a gathering outside, but a gang that controls an entire city came to their home and discussed something about not paying up on time to live in that city. Since they "didn't", the gang slaughtered and burned them all. Only Nev and Josh were the only ones alive. The two tried escaping, but Nev saved Josh by pushing him out of a massive crossfire and he couldn't jump out the way in time. Before he died, he gave Josh his special golden armband he had for years. Nev was the only member of the family Joshua can bury at a cemetery a few days later, and that's what he did for Nev. But Ten years later, some strange slimy chemical spilled onto Nev's grave and burned into the dirt and coffin until it found his rotted body. That same slime covered Nev, then regenerated his body and revived him. But the thing is... that's not the real Nev. Whatever that slime did, it made a new "host" of that body that simulates "zombification" and cut the soul of that body off and leaving it in the Netherworld forever. But the body can still be controlled like a normal rabbit and speak well, but was currently confuzzled about what happen with very hazy memories. His body is slim, filled with bullet holes and a missing right ear. Also has small sharp fangs and very long claws on his left hand. 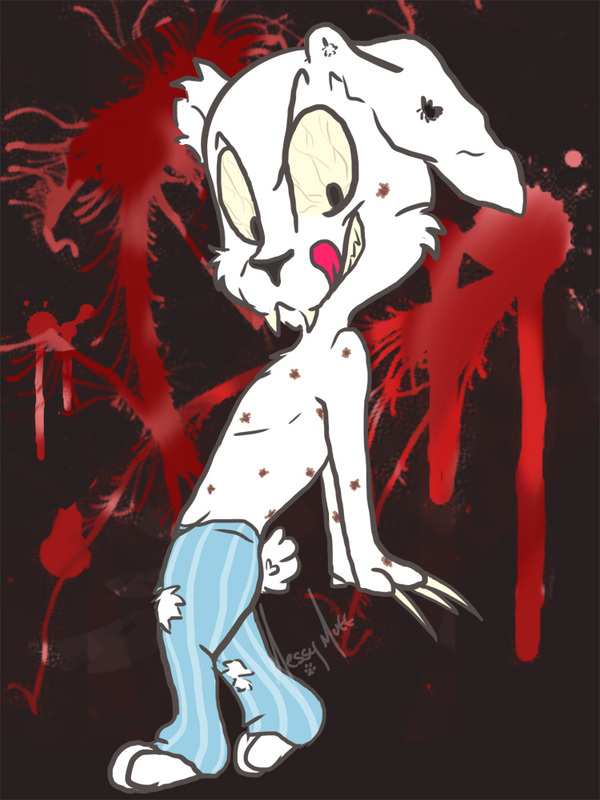 I got this chibi freebie from MessyMutt during her stream, and I ask her to draw my rabbit Nev.
Backstory reminds me of Prototype meets The Punisher. And cutie weird undead bunny. GAH, this was so long ago I completely forgot about him x.x But thank you!